Rick Garbrandt of Sherrodsville, Ohio, removes a covering over a clean-out hole in a brick kiln at a Belden Brick Co. manufacturing facility in Sugar Creek, Ohio. 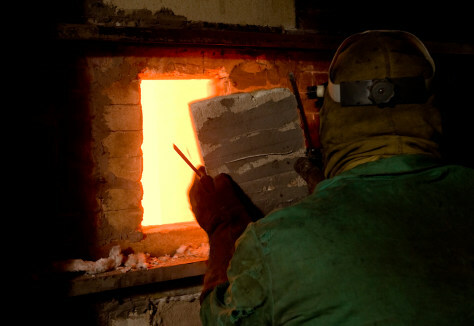 The kiln runs on natural gas and reaches temperatures of 2,000 degrees. Chairman Bill Belden told The Associated Press things will change for the 124-year-old family-owned company, which has thrived on the region's rich red clay and shale and its cheap energy, if Congress approves the climate bill it is considering.